The weekend protests were sparked by a hike in fuel prices but now also decry low wages and pensions and falling living standards in the European Union's poorest country. Sofia - Thousands of Bulgarians blocked major roads and border checkpoints to Turkey and Greece on yesterday as weekend protests against high fuel prices widened to reflect general discontent over low living standards in the EU's poorest country. Protesters blocked traffic for hours at various points along major highways before paramilitary police dispersed the crowds, public radio BNR reported, a day after similar protests across France. Tensions flared on the Maritsa highway leading to border checkpoints with Turkey as protesters managed to break a police cordon. About 2,000 security officers were deployed as a second day of rallies were held in dozens of towns on yesterday. More were planned on Monday. In the capital Sofia several dozen protesters marched along major boulevards shouting "Mafia!" and "Resign! ", bringing traffic to a standstill. The weekend demonstrations started three weeks ago over a hike in fuel prices and planned increase in taxes on older vehicles. But they grew to decry low wages and pensions and falling living standards in the European Union's poorest country, where purchasing power is barely half of the EU average. 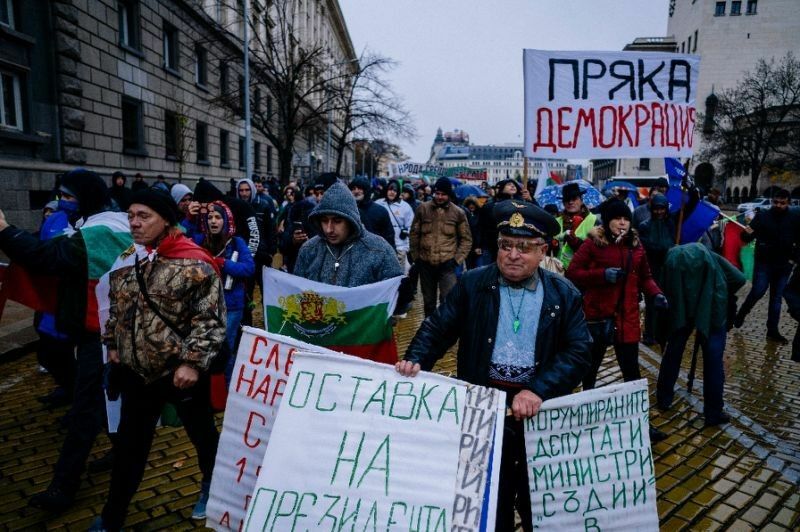 Some protesters called for the resignation of the coalition government of conservative Prime Minister Boyko Borisov. The premier's nationalist allies however reaffirmed their backing for the cabinet at the weekend after the resignation of one of their vice premiers on Friday.